Millions of Dollars is a frenetic negotiation/bluffing game new at Spiel 2016 from Matagot. The designer is unknown to me prior to the fair, though the Israeli designer has at least two new games at the fair this year, this game and Naova at AMIGO. 1) Planning – First, a Loot card is drawn and placed on the table. Everyone can see how much is at stake (between 8M and 12M) as well as the ante required from the players that want to take part in the robbery. 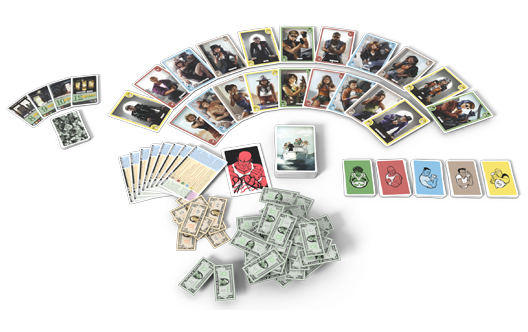 Some of the cards even highlight a particular role which will get a larger share of the pie if the heist is successful. Each player then secretly and simultaneously chooses a Character card from their hand and places it facedown on the table with their ante on top of the card. Each player also puts a matching Role card into the center of the table. These Role cards are shuffled and then one is discarded face down. The other Role cards are then shown face up on the table. 2) Negotiation – Now, in this phase, players talk/negotiate/bluff about the roles they are playing in the heist. One of the reasons that there is negotiation now is that in the next phase, if there are two or more players who have the same role, they are all eliminated from the scoring – we’ll get to that in a second. In any event, players can leave the heist on their own, they can try to bribe others to leave or perhaps accept a bribe to leave themselves. You have imperfect information because you can see Role cards except for one – and you’ll never know which player’s Role card has been excluded from view. Any player who chooses to leave gets his Ante back and is not allowed to say anything at all until the end of the Round. Then, the Brutes are asked to reveal themselves. If there are two or more people who reveal, they are eliminated and they DO NOT lose their Ante (they are the only character not to lose their Ante). If there is only one Brute, they still take back their Ante, and they get an Intimidation card which can be discarded at any point in the future to look at any player’s Character card. Third, the Drivers are asked to reveal themselves. If there are two or more people who reveal, they are eliminated and they lose their Ante. If there is only one, they take their Ante back and remain in the Heist. Fourth, the Crooks are asked to reveal themselves. If there are two or more people who reveal, they are eliminated and they lose their Ante. If there is only one, they take their Ante back and remain in the Heist. Finally, the Masterminds are asked to reveal themselves. If there are two or more people who reveal, they are eliminated and they lose their Ante. If there is only one, they take their Ante back and remain in the Heist. Again, the players who were named by the Snitch are eliminated as well. If this leaves only the Snitch, then the Snitch is also eliminated and must pay a 3M penalty. Place the stated Loot amount on the table as written on the card. If a player has 20M or more at this time, or if this is the end of the eighth round, the game is over. The player with the most money wins. There is no tie-breaker. Otherwise, set up the game for another round. That being said, I’ve actually had a pretty good time with Millions of Dollars. Though it involves negotiation and bluffing, the lack of luck in the game (which I had expected in a French title) gives you much to consider while doing your best to both (mis)represent yourself and figure out what your opponents are doing. After roles are chosen, you see all the chosen Roles but one – and this gives you a certain amount of information to go on. First, if you see a matching pair face-up, the group knows that it’s in at least one player’s best interest to pull out of the Heist. But who should it be? And for how much? If you don’t see a pair, that’s no guarantee that you’re safe – because after all, there are always at least one fewer roles than players, so you still have to figure out who is playing what role. And, sharp players will always be trying to flush out other players because the fewer players left in the heist at the end means more loot to be taken home by the remaining players! We’ve played the game with 4 and 5 players, and I’ll admit to much preferring the game with at least 5 because the Snitch action really adds a second dimension to the game and makes it much more interesting. There is a lot more tension in the game when you’re never quite sure how things will shake out as no one is truly safe (well, except the Snitch). Of course, this added layer of safety makes the Snitch a desirable role, and this causes a lot of multiple Snitches to be seen too! The rules also include a variant which I think adds a lot to the game – which is a restriction against choosing the same role in two consecutive Heists. This forces players to take on different roles and possibly different strategies. Also, knowing an extra piece of information about which role someone might have taken in any round also helps make the game a bit more cerebral. I will say that the order of operations can be cumbersome at first, so we made a handwritten aid sheet to place on the table so that everyone knows the exact order of role revelations as well as the multiple steps required to resolve the Loot distribution. While it’s not my favorite style of game, Millions of Dollars is a pretty good one for the genre, and I like the fact that it does not overstay it’s welcome. Both games that I’ve played have come in right at 30 minutes, and that’s right at the upper end of my tolerance for this sort of game. The box size is small, and the fact that I can tolerate it at all probably says much about the game itself.